I want to invite you to shape the future of your neighborhood. 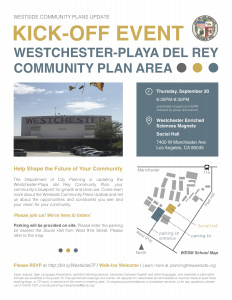 This Thursday (September 20), the Department of City Planning is hosting a Kick Off Event in Westchester to begin introducing the upcoming Community Plan Update process. This is your opportunity to create the guidelines for future development in the Westchester/Playa area. Los Angeles has a broken planning system and this is your opportunity to fix it. Instead of basing development on outdated plans, which fosters a culture of speculation, variances, and zone changes, the City of Los Angeles is finally updating its community plans – giving us neighbors a chance to steer and shape development for the next decade. If you participate in this process, you can determine how our neighborhoods will grow, and you can help shape the city for the next generation. Please find more information about the event and an RSVP link in the forwarded email below. The Westside Planning Team has officially concluded the Planning 101: Community Planning presentations! Thanks again to everyone who joined us and provided feedback. The next series of outreach activities will be four Kick-off events, with one taking place in each Westside Community Plan Area. The first event is scheduled for Thursday, September 20, 2018 at Westchester Enriched Sciences Magnets. This Kick-off event will focus on the Westchester-Playa del Rey Community Plan area. This will be a great opportunity for you to tell us about the opportunities, and constraints you see as well as your vision for your community. Your participation is very important to the Community Plan Update process. Bring your family and neighbors. We look forward to seeing you there!